Dry, indoor air is always the result of an air leaky house (unless someone has a dehumidifier turned on). Among other things, it leads to dry skin and static electricity. Moist indoor air from daily living activities is replaced by drier winter air due to air leaks in the shell or ductwork. What Does the Type of Furnace Have to Do with Anything? Wait! I’ve heard a gas furnace dries out a house where an electric heat pump won’t as much. What does the type of fuel got to do with drying? It is true that the temperature coming out of the supply register for a gas furnace is at least 105 F and goes up to 125-140 F degrees. For an electric heat pump, expect around 90 F.
Hot air rises. When there are holes in the ceiling for any reason, heated air leaks into the attic. The replacement air comes in through cracks in the shell (walls, ceilings, and floors). All the moisture we put into it by our daily living activities leaves too. All a gas furnace does more than a heat pump is create a faster heat loss, leading to a dryer house than one with a heat pump. Why? Let’s see . . .
Dry Air – Air Leakage Connection. What does air leakage have to do with dry air? If you live on the west coast during the winter, not much—you’ve got a very different problem. Consider colder air with high relative humidity. When this cold air is drawn into the house, the relative humidity drops like a rock as the cold air is warmed. 35 F degree air with a relative humidity of 90%, when raised to 68 F, has a relative humidity of 25%. Human Comfort Level. People like relative humidity in the 35-45% range. Below that gives my wife what she calls “lizard skin”. Some people get bloody noses. Others have respiratory issues. Itchy eyes, too. What do most people do? They buy a humidifier! Guess what else comes in with the cold, outdoor air? Dust! Any time I’ve ever used a humidifier, I ended up with a relatively thick layer of white dust all over everything! In addition, my wife starts using heavy amounts of moisturizing cream. YUCK!!! Especially when fragrances are added. Furniture. Dry air is equal opportunity for where moisture is drawn. Not only will it dry you out, it will dry out your furniture too. Humidifiers help. Often, furniture polish is used. They don’t smell good either! Static Electricity. Dry air and static electricity go together. Those free electrons find it easier to arc in dry air. Hopefully, all your electronic gadgets are protected somehow. Grounding is good! Otherwise, static electricity will destroy sensitive electronics. 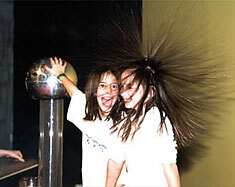 Humidity is key for controlling static electricity. How Should the House Work? A house in cold climates has enough moisture produced internally by daily living activities to wreck havoc on it if moisture vapor is not managed. One of the first problems we discovered in this industry when we air sealed houses was the increase of indoor relative humidity. So a humidifier is not really needed. A good ventilation system is. Dry Air / Static Electricity Solution. Air seal at least the big holes, such as fireplaces and open chases in the attic. You’ll never get every air leak, so seal increasingly smaller holes until the desired air infiltration rate is achieved. It’s usually bounded by time or money. The law of diminishing returns applies! The result will be a heater that runs less than it did before. As a result, less outdoor will be drawn in, allowing the moist air generated by living activities to keep the house moist. Diagnosing and correcting air leakage, including duct leakage, can be found on our home performance website. If you can’t air seal your house, or there aren’t enough people living there, you’ll may need a humidifier. Static electricity and dust go together. Next time, dust!